Battle is all about family carnival fun on Sunday September 30 from midday until 4pm. Festival Fiesta welcomes an array of brilliant fun live events and activities to the Abbey Green, as well as inside Battle Abbey itself (from 2pm). 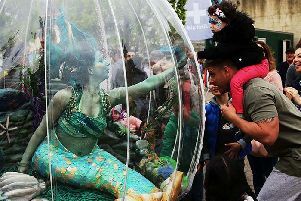 Circo Rum Ba Ba will bring a life-size inflatable whale to Abbey Green and will be inviting audiences inside for new show Drastic Plastic, a tale of sea creatures and their battle to survive in an ocean full of rubbish, featuring exquisite puppets, comedy and music. The audience help to save the Turtle and the Whale from a deluge of plastic! Performances at 12pm, 12.30pm, 1pm, 2.30pm, 3pm, and 3.30pm. Taking place in front of Battle Abbey, Bootworks Theatre’s We’re Gonna Need A Bigger Boat is an interactive show about small town communities and the movie Jaws, exploring notions of belonging. Performances at 12.15pm, 12.45pm, 1.45pm, 2.15pm, and 3.30pm. There will also be live music and dance.